Want outfits like Irene, Seulgi, Wendy, Yeri and Joy? Red Velvet’s MV for Red Flavor has reached over 50 MILLION views (!) and we’re now bringing you a breakdown of their clothes and where to get them. They’re out of pink, but they still have black. The Red Valentino flamingo brocade shorts and dress are discontinued. Seulgi’s Mischief Fitted Basic Sleevless Top is sold out and hasn’t come back in stock for several months. I hope you enjoyed this post on Red Flavor by Red Velvet. This is one of my favorite songs right now. They have a wonderful sense of style that is youthful and pretty. In this post, I tried a bit of a different format where I put the sold out stuff on the bottom and make the picture black and white. I want to make it clear that these clothing items aren’t available anymore, at least not from the site I found. Usually if they are not available anymore on that site, it’s because the manufacturer discontinued it and have moved on to making other things. So, even after these are sold out, I usually can’t seem to find it in ANY store because they just don’t make it anymore. Now, I’m talking about the exact same kpop clothing items you see them wearing in the video. You can always find look-a-likes and similar items anytime. For more posts like this, visit our home page which features all kinds of kpop and Korean fashion articles here (http://kpopfashion.net). By the way… girls groups not your thing? How about our EXO posters and shirts! A lot of our posts are a bit on the shorter side, but we we have some single posts that we keep adding to as they have become very popular over time. One of these is our post on our favorite Korean dress. If you liked this article, you’ll most likely enjoy that one as well and can see it here. Love the clothes in TWICE’s MV ‘Likey’? ‘Likey’ has over 68 MILLION views now on Youtube! If you want to see the ACTUAL clothes TWICE is wearing in the MV, check out our fashion finds below. The Odd One Out model on the site is also wearing Jihyo’s V Neck top (above) in the Cut Pock String Skirt pictures. I was confused at first, the page I linked to is for the skirt, which you will see if you scroll down a bit on their page. If you want to see the page for the V Neck, click on one of the V Neck links above under Jihyo’s section. Jihyo’s DSCO – Hard Pure Please Skirt – Mina Wears the same one in black. For other great fashion finds, including our tops picks on Korean websites for shopping, on our home page main feed. We have a nice, robust Google + where you can see more posts on fashion items like blouses and the latest Korean dress styles. Also, you probably have found this post because you are on our email list for Kpop Fashion Finds. If not, be sure to sign up for it to get our exclusive finds like this one for other stuff like BTS posters and other fashion trends in Korea. You’ll get some of the latest kpop fashion sent straight to your email with links of where to buy. 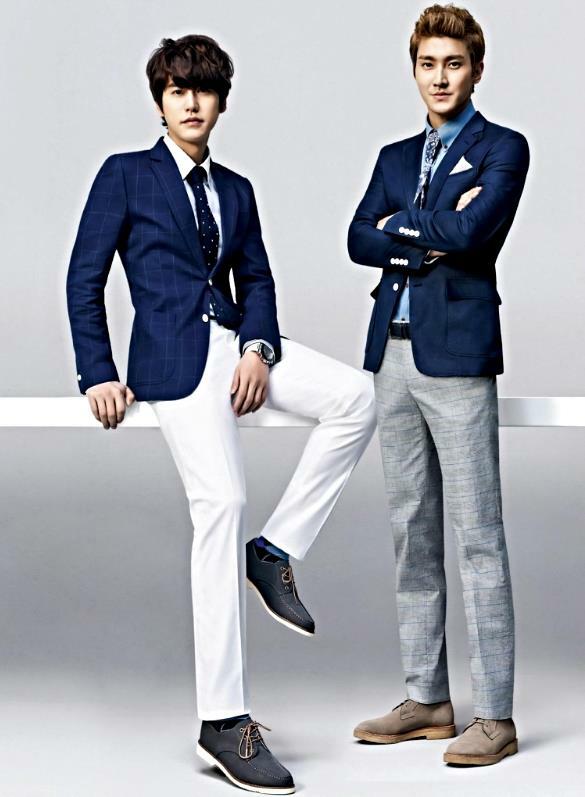 Siwon and Kyuhyun looked sharp for their SPAO photo shoot for the Korean clothing brand’s Spring/Summer collection last year. I know this collection is not their most recent, but it definitely is one of my favorites SPAO has had. I am so excited to shop this store because 1) their clothes are just awesome, and 2) the company has a deal with S.M. Entertainment and so uses their artists as models! Of course I want to wear outfits Girl’s Generation wore! Lol. I spotted (no pun intended) Kyuhyun’s polka dot tie here in this picture and thought to myself, “this could be cute on a guy or a girl!” Men can piece it together with dressy-casual pants and jacket like Kyu is wearing here, and sonyeo can wear it with a similar but more feminine horseback-riding type outfit, or a skirt to get the smart and cute private school student look. What other ideas do you have for this tie? This SPAO photoshoot with Siwon and Kyuhyun is one of my favorites this week. To see more posts from previous week, go to our home http://kpopfashion.net/ and check out some of our other Korean skirts and other clothing, too. We’d also like you to give us some plus ones on our Google Plus page as that would help us a lot in spreading the word about our Korean fashion website. A lot of people think of EXO as the new Super Junior. What do you think? Post below!